In Dec. 2011, I wrote a post about how Swatch Group was “Creating a Shakeout in the Swiss Watch Industry“. Today I just read an update to that event. The Reuters article gives a clearer picture of Swatch’s overall strategy to make things more difficult for strong rivals such as LVMH. Sometimes, finding good topics for this blog can prove quite challenging. So, I’m always thankful for the readers who send in great material – some of which I am using in today’s post. First, you should know that the luxury goods and services market in China is growing at an astronomical rate. Forecasts indicate that Chinese luxe will grow at a rate of 20% CAGR by 2015, at which time it will be the second largest market in the world. A growing middle class living outside of the tier one cities are spending more on gems and gold. Lastly, the wealthiest segment of the Chinese population are been getting richer. 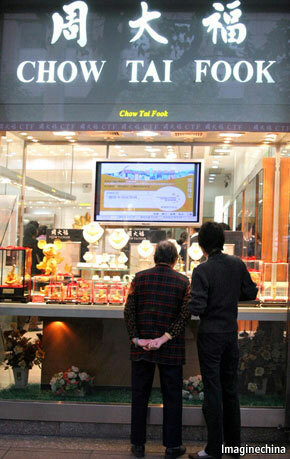 What is most surprising is the fact in spite of the availability of world renowned jewelry manufacturers and retailers such as Swarovski and Cartier, Chinese consumers are paying increasing attention to homegrown brands – specifically Chow Tai Fook (CTF). The company, owned by billionaire Cheng Yu-tung recently went public. With 1500 outlets and 2010 sales of $4.5 billion, CTF is twice the size of Tiffany & Co.
I’ll leave you with a graphic from The Economist, developed by George Washington University and L2 (a think-tank). It asserts that CTF, as a brand, outperforms well-known international brands in the hearts and minds of Chinese consumers. A watchmaker at Edox, one of the Swiss companies challenging Swatch's decision to stop selling timepiece components.